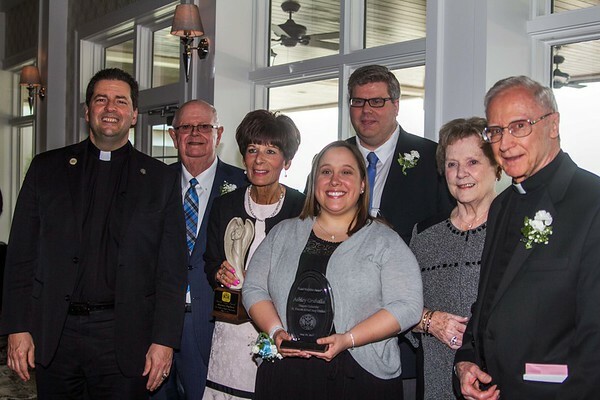 Our Lady of Angels Association held its annual Vincentian Charities Dinner last night at the Niagara Falls Country Club. The dinner is sponsored by James and Mary Glynn of the Maid of the Mist Corporation.From left are Rev. James J. Maher, C.M., President of Niagara University, James Glynn, Maureen Ingham, Principal of St. Peter's School who received the "Special Angel Award," Ashley Gruhalla, moderator of the Niagara University Society of St. Vincent dePaul Soup Kitchen,, accepted the "Good Neighbor Award" on behalf of the organization, Jeff Paterson, CEO of Empower, was awarded the "Rev. Martin J. Blake, C.M. Award", Mary Glynn, and Re. William J. OBrien, C.M., who is celebrating his 50th Anniversary of Ordination as a Vincentian Priest was also honored.